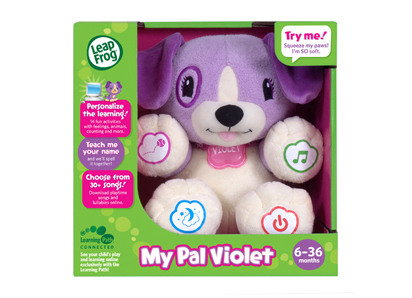 Give learning a personal touch with this soft, cuddly purple puppy named Violet. 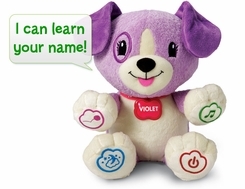 Violet connects to the computer so you can customize the music and personalize the learning with your child's name and favorite food, animal and color. Violet comes with 5 pre-loaded songs, or you can select and download your choice of learning tunes and lullabies from an online list of 30 songs. Press a paw to play music, learning songs or games. Parents can connect to the online LeapFrog Learning Path for customized learning insights and ideas to expand the learning.Internet connection required to personalize Violet with your child’s name and favorite items or to change songs.